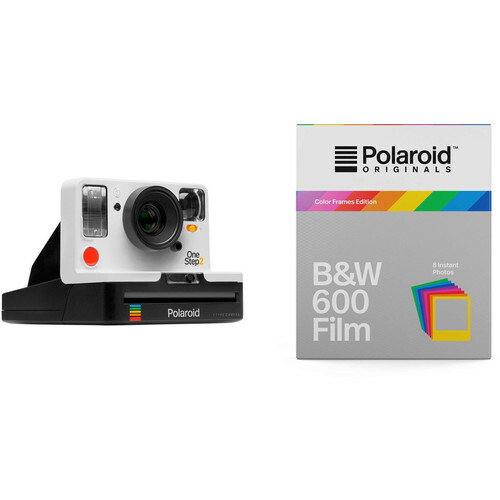 Comprising everything you need to get started, the white Polaroid Originals OneStep2 VF Instant Film Camera with Black & White Color Frames Film Kit from B&H bundles the fun and easy-to-use camera with one pack of black & white 600 color frames edition instant film. Based on the original Polaroid OneStep from 1977, the OneStep2 VF from Polaroid Originals is a contemporary take on the classic instant film camera. Designed to be simple and easy to use, this camera accepts both i-Type and 600 instant films to produce 3.1 x 3.1" prints, and has true point and shoot functionality. The recognizable form factor of the camera recalls its predecessor, but has an updated white polycarbonate shell with an integrated extended optical viewfinder for accurate framing, a built-in flash, self-timer function, and a familiar bright red shutter release. The fixed 106mm lens offers a comfortable field of view for everyday shooting, and its fixed focus design suits photographing subjects as close as 2' away. Powering the camera is a built-in 1100mAh lithium-ion battery pack, which is rated for up to 60-days of use per charge. Updated extended optical viewfinder provides a clearer, more accurate means for framing your images. Box Dimensions (LxWxH) 7.0 x 5.3 x 4.9"
OneStep2 VF Instant Film Camera (White) is rated 2.8 out of 5 by 12. Rated 5 out of 5 by Walter from Zoom disappointments The focus of this polaroid ranges from 2' to Infinity. It's truly amazing per the description. But the photo didn't look great when zoomed. Rated 5 out of 5 by Philip from Cool retro camera but dont expect iPhone quality This is a cool retro camera that will give you photos that actually look like they were taken in 1979. If you are expecting iPhone quality photos printed on a nifty Polaroid instant print film frame, then you will be disappointed. Judging by the quality of the photos, the under-saturated colors and the look and feel of the overall image quality, I doubt this camera was introduced to compete with a smart phone. This camera is ideal for those with a creative streak who want to experiment with a different look all together. Consider taking a whole bunch of photos, scan them into your computer and then create a collage. That would be very artistic and a good use for this camera. Another good use would be to use the photos to hastily storyboard a video by pasting the photos onto a large piece of cardboard and use a black felt tip marker to write and draw in examples. An even funner use is to just horse around taking photos and then laugh at what they look like. I consider this camera to be a toy but in the right hands, even a toy can create great artistic beauty. A good photographer with a keen eye can pick up this camera and still end up with great photos with that late 1970s look. Rated 1 out of 5 by Horten from Not so accurate framing I thought it would be the easiest usage. What I point and shoot at using my polaroid originals I'd get printed exactly as it is--what I thought would happen. But not with the latest photo I took. It didn't print out as great as I thought it would. Rated 1 out of 5 by Mike from Don't come out in much detail I don't think that I've been able to make one solid print yet and I've even made sure that I took the shots in good lighting. The prints don't come out in much detail either. Rated 1 out of 5 by Emily from Supposed to be for roup portraits Since the polaroid orignals onestep2 has self-timer function that is perfect for our group portraits, I figured the fambam photos would turn out amazing. But I can't seem to work well with the self-timer.